Syria's emergency law enshrines the autocratic nature of the Assad dynasty's rule. It restricts public gatherings and the free movement of individuals, it allows government agents to arrest "suspects or people who threaten security," it authorizes the monitoring of personal communications and it legalizes media censorship. It has been in place since the 1963 coup d'état that brought the Baath Party to power. That plot was instigated in part by Hafez al-Assad, the previous President and father of the current one. Indeed, as some observers have noted, the emergency law is older than President Bashar al-Assad himself. But, suddenly, as Syria experiences the onslaught of the Arab Spring, the emergency law is becoming the regime's sacrificial lamb. Just days after announcing that a committee would be formed to study lifting the nearly half-century-old law, Syria's presidential adviser Buthaina Shaaban told several foreign journalists on Sunday that the measure would "absolutely" be repealed. She did not, however, say when that would happen. The lightning decision appears to have been made without benefit of committee or recommendations  the regime's usual apparatus for watering down or ultimately rejecting reforms. Indeed, a proposal to review the emergency law that was put almost routinely forward just a month ago was unanimously rejected by Syria's rubber-stamp parliament, according to Radwan Ziadeh, a Syrian dissident based in Washington, D.C., and visiting scholar at the Institute for Middle East Studies at George Washington University. All this takes place as the emergency law appears to have lost some of its teeth. On Friday, people in at least a dozen cities staged mass demonstrations demanding freedoms and reform, prompting a brutal security crackdown that left dozens of protesters dead. The demonstrations took place despite the emergency law's prohibition of such gatherings  and may indicate that, at least for now, large sections of the populace no longer feel cowed by the law. Perhaps to ameliorate public rancor, the regime also reportedly released some 260 political prisoners on Friday night from Saydnaya prison. Most had served the majority of their sentences. The imminent repeal of the emergency law was welcomed by Ziadeh and other dissidents contacted by TIME. They nonetheless cautioned that in practical terms it may not mean real change. In theory, repealing the law will activate "about 40 items in the constitution which were frozen because of it, like freedom of speech and the right to demonstrate," says Ayman Abdel-Nour, a former Baathist and longtime friend of Assad's, who now lives in self-imposed exile in Dubai, where he edits the independent website All4syria.org. But in practice, he fears that just as the old law is discarded it will be replaced by a new, tougher one, enacted so that, in essence, Assad "will take with one hand what he gave with the other." In addition, security forces are likely to continue to enjoy immunity from prosecution, a condition that affords them huge amounts of power. A separate act, Legislative Decree 14, issued in 1969, says that "no legal action may be taken against any employee of General Intelligence [the dreaded Mukhabarat] for crimes committed while carrying out their designated duties, except by an order issued by the director." No such order has ever been issued. In 2008, President Bashar al-Assad extended this immunity to members of other security forces through Legislative Decree 69. There are other laws that inhibit freedom without the government having to turn to the emergency law. Apart from the wide-ranging powers still afforded to the security forces by virtue of their immunity from prosecution, membership in the Muslim Brotherhood, for example, will remain a capital offense under Law 49 (1980). 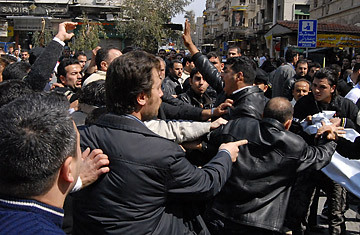 See why Syria's protests have turned bloody.